3,836 SF available - Ideal for flex, office, manufacturing, the space will be delivered in warm vanilla shell at a lease rate of $12/SF NNN (CAM est. $4.50/SF). See floor plan under Documents. Shared parking on-site for over 80 vehicles. 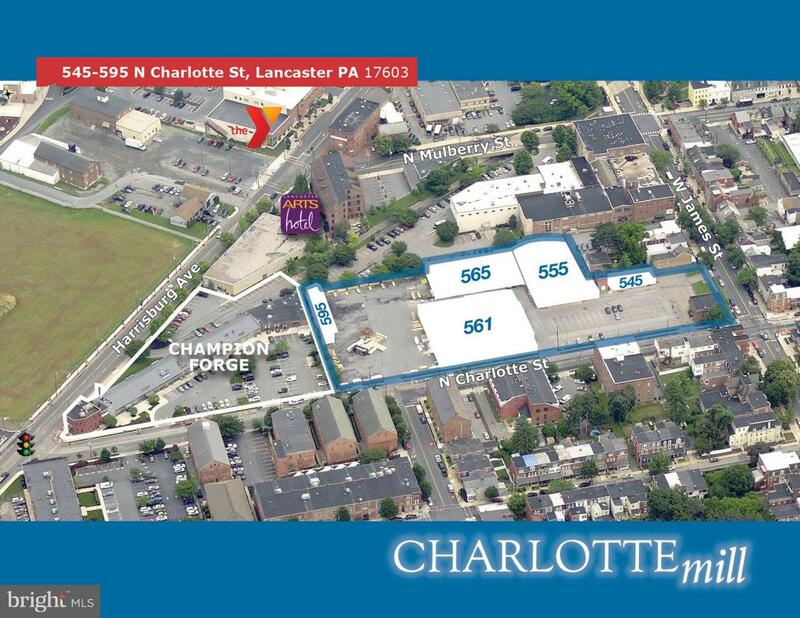 Rare opportunity to participate in Lancaster's next urban renewal, Charlotte Mill is brought to you by the same quality developers as Harrisburg Avenue~s Champion Forge. Located in Lancaster~s West End, Charlotte Mill is situated in one of the most sought after neighborhoods on the East Coast, according to Realtor.com and Yelp. Neighboring Franklin & Marshall College with a walk score of 91 and minutes from the Harrisburg Pike exit of US Route 30, this mixed use site is positioned to serve a variety of tenants including office, medical/dental, retail, hospitality, flex and warehousing. Accessibility Features Other Association YN No Business Type Commercial Central Air YN Yes Current Use Commercial Electric 200+ Amp Service Existing Lease Type Triple Net Heating Fuel Natural Gas Hot Water Electric Incorporated City Name Lancaster City Navigable Water YN N New Construction YN No Number Of Units Total 0 Original MLSNumber 300933349437 Ownership Interest Other Purchase Optional YN No Sewer Public Sewer Utilities Natural Gas Available Vacation Rental YN No Water Source Public Zoning Mu Zoning Description Mixed Use: A Variety Of ResidentialCommercialCulturalLight industrial And Other Miscellaneous Uses Are Permitted.